Provided photo Springcreek Primary School second grader Peyton Bennett tries out his wings during a science exercise with the Miami Soil and Water Conservation District and county park naturatlists. The students are learning about Monarch butterfly migration patterns, in addition to making bird feeders and learning about animals that are extinct and/or threatened in Ohio. Springcreek Primary School second grader Peyton Bennett tries out his wings during a science exercise with the Miami Soil and Water Conservation District and county park naturatlists. The students are learning about Monarch butterfly migration patterns, in addition to making bird feeders and learning about animals that are extinct and/or threatened in Ohio. 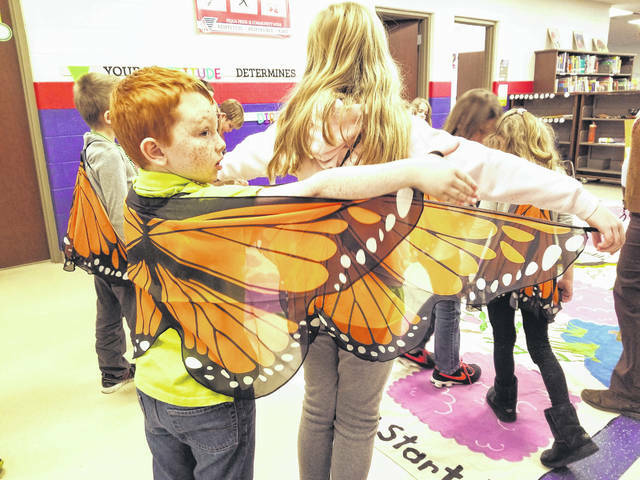 https://www.dailycall.com/wp-content/uploads/sites/30/2018/11/web1_butterlies.jpgProvided photo Springcreek Primary School second grader Peyton Bennett tries out his wings during a science exercise with the Miami Soil and Water Conservation District and county park naturatlists. The students are learning about Monarch butterfly migration patterns, in addition to making bird feeders and learning about animals that are extinct and/or threatened in Ohio.